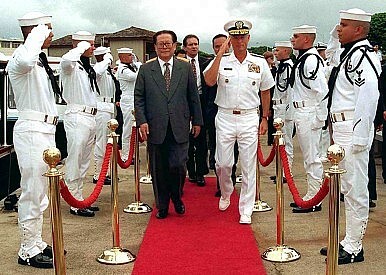 Commander in Chief, U.S. Pacific Command Adm. Joseph W. Prueher (right), U.S. Navy, escorts Chinese President Jiang Zemin (left) on Oct. 26, 1997. Image Credit: DoD photo by Petty Officer 2nd Class Tina M. Ackerman, U.S. Navy. The article from People’s Daily seems to be a veiled reference to former leader Jiang Zemin. According to the commentary, these meddling officials create difficulties for new leadership, making it hard for them to complete their work. Interference from retired officials also creates a “debased mood” in departments where it occurs, as officials are unwilling to act. The People’s Daily commentary pointedly did not name any names, leaving readers to make their own inferences. But the Beijing News provided its own list of retired-but-not-retired officials, all of whom are also “fallen tigers” in the anti-corruption campaign: former Politburo Standing Committee member Zhou Yongkang (the most classic example, according to Beijing News), and high-ranking provincial-level officials Si Xinliang, Yang Baohua, and Tian Xueren. The implication is clear: exerting influence post-retirement is a hallmark of corruption and manipulation of one’s authority for personal gain. Beijing News also cited examples of officials who did retire completely: former Vice Premier Wan Li, former Premier Zhu Rongji, and former President Hu Jintao. Meanwhile, the article notes that Deng Xiaoping, held up as China’s great reformer, personally pushed to abolish life terms for government officials – in fact, the 35th anniversary of Deng’s major speech on the subject is coming up on August 18. While Deng and Hu are held up as examples of leaders who knew the importance of retiring, the man who led China in between their tenures — Jiang Zemin — is notably absent from the Beijing News piece. It’s no surprise that Chinese media would avoid openly pointing to a former top leader as a wrong-doer, but that Beijing News declines include him among the list of positive examples (which included Jiang’s premier, his predecessor, and his successor) sends a strong signal of disapproval. In fact, Jiang may be the most famous example of a Chinese politician who seeks to exert influence well after his formal retirement. Jiang even held on to the post of chairman of China’s Central Military Commission for two years after stepping down from other top Party and governmental posts, a move that hampered Hu’s ability to control the military. Jiang was also believed to be heavily influential in determining the leadership lineup that was announced at the 18th National Party Congress in 2012 – a full ten years after he supposedly retired. The timing of the People’s Daily piece also hints at a veiled message to Jiang. Over the past week, state media has been busy making the point that there will be no true Beidaihe summit this summer. In the past, retired and current leaders have met (with little to no state media fanfare) at the seaside resort to hammer out policies for the fall Party meeting. This year, state media has been adamant that policy decisions were made in the July 20 and 30 Politburo meetings — and would not be discussed at Beidaihe. In other words, state media wants to highlight that policy is being set by sitting officials only, without waiting on input from retired leaders like Jiang. There are other hints that the current government, under Xi Jinping, is trying to weed out Jiang’s influence. As Bo Zhiyue noted for The Diplomat, the two highest-ranking military officers (Xu Caihou and Guo Boxiong) to be taken down in the anti-corruption campaign had strong ties to Jiang.